The Rose Center for Earth and Space is a part of the American Museum of Natural History in New York City. The Center's complete name is The Frederick Phineas and Sandra Priest Rose Center for Earth and Space. The main entrance is located on the northern side of the museum on 81st Street near Central Park West in Manhattan's Upper West Side. Completed in 2000, it includes the new Hayden Planetarium, the original of which was opened in 1935 and closed in 1997. Neil deGrasse Tyson is its first and, to date, only director. As of 2015, five shows have premiered in the theater. The first show, Passport to the Universe, opened with the new theater and features the voice of Tom Hanks as a guide along a voyage from Earth to the edge of the observable universe. The Search for Life: Are We Alone? debuted in 2002, with narration by Harrison Ford describing the possibilities of extraterrestrial life. Opened in 2006 and narrated by Robert Redford, Cosmic Collisions examines the role that impacts have played in shaping the universe—including visualizations of Earth's magnetosphere, the formation of the Moon, and the meteorite impact that contributed to the end of the age of dinosaurs. Journey to the Stars, narrated by Whoopi Goldberg, premiered on, July 4, 2009, featuring extraordinary images from telescopes on the ground and in space and stunning, never-before-seen visualizations of physics-based simulations. Dark Universe, narrated by Neil deGrasse Tyson, premiered on November 2, 2013. The AMNH Exhibitions Lab or AMNH Department of Exhibition is an interdisciplinary art and research team at the American Museum of Natural History that designs and produces museum installations, computer programs and film. Founded in 1869, the lab has since produced thousands of installations, many of which have become celebrated works. The department is notable for its integration of new scientific research into immersive art and multimedia presentations. In addition to the famous dioramas at its home museum and the Rose Center for Earth and Space, the lab has also produced international exhibitions and software such as the revolutionary Digital Universe Atlas.The exhibitions team currently consists of over sixty artists, writers, preparators, designers and programmers. The department is responsible for the creation of two to three exhibits per year, making the AMNH one of the most extensive exhibition creators in the world. These extensive shows typically travel nationally to sister natural history museums. Due to the strong relationship between the lab and the museum's extensive research and curation wing, the department has been among the first to introduce brand new topics to the public. They have produced, among others, the first exhibits to discuss Darwinian evolution, human-induced climate change and the mesozoic mass extinction via asteroid. The Children’s Museum of Manhattan was founded by Bette Korman, under the name GAME (Growth Through Art and Museum Experience), in 1973. With New York City in a deep fiscal crisis, and school art, music, and cultural programs eliminated, a loosely organized, group of artists and educators set up a basement storefront to serve Harlem and the Upper West Side. With a challenge grant from the National Endowment for the Arts, a city-owned courthouse was renovated into a small exhibition, studio, and workshop and renamed the Manhattan Laboratory Museum. The museum became the Children’s Museum of Manhattan in the 1980s and moved to its current location on West 83rd Street in 1989. Its audience has grown to 325,000 visitors each year, which includes 30,000 children who visit as part of a school group and more than 34,000 children served through offsite outreach programs. Ennead Architects LLP (/ˈenēˌad/) is a New York City-based architectural firm. Previously known as Polshek Partnership, the firm's partners renamed their practice in mid-2010.The 175-person firm offers architecture, master planning, historic preservation and interior design services. The majority of the firm’s work is for cultural, educational, governmental, and scientific not-for-profit institutions. The firm is presently led by twelve Partners: Timothy P. Hartung, Duncan Hazard, V. Guy Maxwell, Kevin McClurkan, Molly McGowan, Richard Olcott, Susan T. Rodriguez, Tomas Rossant, Todd Schliemann, Peter Schubert, Don Weinreich, and Thomas Wong, with the founder of the original Polshek Partnership, James Polshek, holding the title of Design Counsel and remaining actively involved on select projects. The Partners established Ennead Architects International LLP in 2012, expanding the studio's geographical reach. In 2014, the firm established a Shanghai office. The firm is a member of the United States Green Building Council, and twenty-five percent of registered architects on staff are LEED Accredited Professionals. The Forbes Galleries, housed within the Forbes Building on Fifth Avenue between West 12th and 13th Streets in the Greenwich Village neighborhood of Manhattan, New York City, United States, was the home of Malcolm Forbes' collection, which the Forbes family continued to exhibit following his death.The galleries closed in November 2014.The collection stemmed from Forbes' lifelong collection of toys, most of which have since been auctioned off. Among the museum's notable exhibits over time included "Olympic Gold", a collection of medals and other collectibles from some of the world's most accomplished Olympians, a number of Faberge Eggs, an armada of 500 ships and 12,000 toy soldiers and one of the original Monopoly boards.The museum was more popular with visitors than it was with New Yorkers. FusionArts Museum(s), first founded at 57 Stanton Street on Manhattan's Lower East Side are a series of curated exhibition spaces dedicated to the exhibition and archiving of "fusion art". The museum was and remains at its successive locations a not-for-profit gallery operated by Converging Arts Media Organization, a not-for-profit arts organization which promotes emerging American and international fusion artists. Though the initial space in Manhattan was converted into a commercial art gallery in 2012 and is currently not operating as a Fusionarts museum, other spaces in Prague, Czech, Republic and Easton, Pennsylvania are. The Girl Scout Museum and Archives is part of the Girl Scout National Historic Preservation Center at the Girl Scouts headquarters located at 420 Fifth Avenue in New York City. It was founded in 1987 to promote and preserve scouting history and its collection dates back to 1912 when the Girl Scouts were founded. The museum holds more than 60,000 photos, 7,000 publications, 650 uniforms and an a/v collection dating back to 1918. Glass mullion system or glass fin system is a glazing system in which sheets of tempered glass are suspended from special clamps, stabilized by perpendicular stiffeners of tempered glass, and joined by a structural silicone sealant or by metal patch plates. 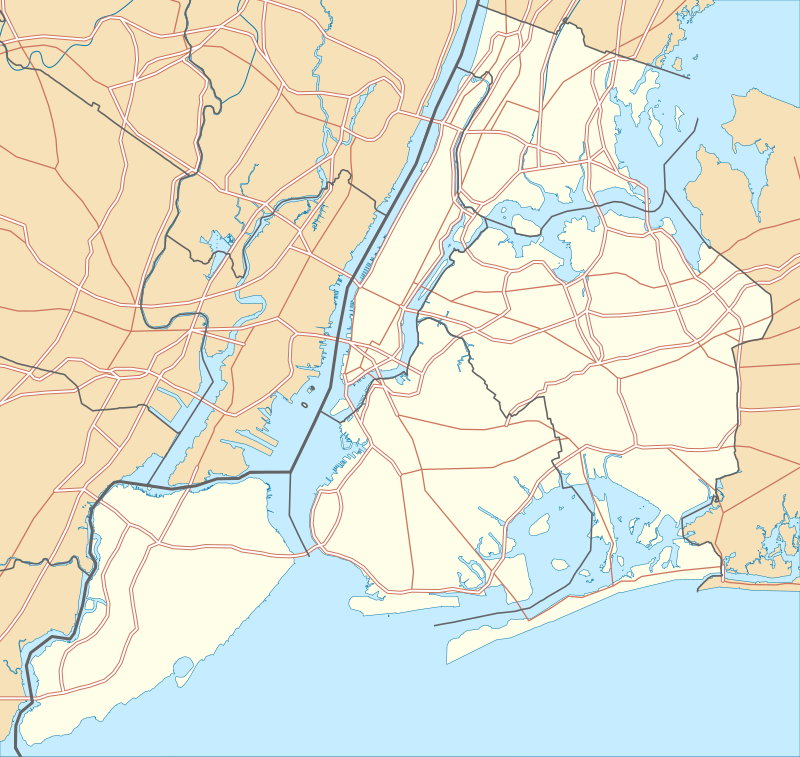 Following is an alphabetical list of notable buildings, sites and monuments located in New York City in the United States. The borough is indicated in parentheses. Mmuseumm is a modern natural history museum located in lower Manhattan in New York City, dedicated to its signature curatorial style of "Object Journalism." The first two locations are on Cortlandt Alley between Franklin Street and White Street, sometimes known as Mmuseumm Alley. Mmuseumm is dedicated to the curation and exhibition of contemporary artifacts to illustrate the modern world. Mmuseumm's first wing, Mmuseumm 1, opened in 2012 in a former elevator shaft. The second wing, Mmuseumm 2, opened in 2015 three doors down. It was founded by Alex Kalman, son of Maira Kalman, and the Safdie brothers. The Museum of Arts and Design (MAD), based in Manhattan, New York City, collects, displays, and interprets objects that document contemporary and historic innovation in craft, art, and design. In its exhibitions and educational programs, the Museum celebrates the creative process through which materials are crafted into works that enhance contemporary life. The Museum of Primitive Art, is a now defunct museum devoted to the early arts of the indigenous cultures of Africa, the Americas, Asia, Europe and Oceania. It was founded in 1954 by Nelson Rockefeller, who donated his own collection of Tribal art. The museum opened to the public in 1957 in a townhouse on at 15 West 54th Street in New York City. Robert Goldwater (1907–1973) was the museum’s first director. The museum closed in 1976, and its collections were transferred to the Metropolitan Museum of Art. The Nicholas Roerich Museum in New York City is dedicated to the works of Nicholas Roerich, a Russian-born artist whose work focused on nature scenes from the Himalayas. The museum is located in a brownstone at 319 West 107th Street on Manhattan's Upper West Side. The museum was originally located in the Master Apartments at 103rd Street and Riverside Drive, which were built especially for Roerich in 1929.Currently, the museum includes between 100 and 200 of Roerich's works as well as a collection of archival materials and still attracts pilgrims from throughout the world. The mission of the Nicholas Roerich Museum is essentially a narrow one: to make available to the public the full range of Roerich’s accomplishments. These, however, are not narrow; they cover the realms of art, science, spirituality, peacemaking, and more. Because Roerich’s activities ranged widely, so do the Museum’s. Ralph Appelbaum Associates (RAA) is one of the world's largest museum exhibition design firms. It has offices in New York City, London, Beijing, Berlin, Moscow, and Dubai. The Yeshiva University Museum is a teaching museum and the cultural arm of Yeshiva University. Along with the American Jewish Historical Society, the American Sephardi Federation, the Leo Baeck Institute, New York and the YIVO Institute for Jewish Research, it is a member organization of the Center for Jewish History, a Smithsonian Institution affiliate located in New York’s Chelsea neighborhood.